One of the best things about the Internet is that I no longer have to send a SASE to find out about things like how to build your own teardrop RV trailer. Remember the SASE? Loompanics Unlimited! Lindsay’s Technical Books! All the best things in life used to come to us via SASE. 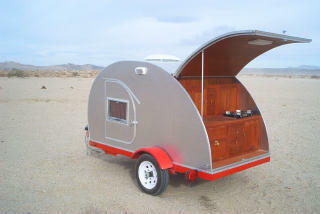 And mark my words, I will build a teardrop trailer. Of course, as someone who has peeled off the skin of an RV trailer and crawled into the subfloor (15 years and 40 pounds ago) to fix a leak, I knew this was theoretically possible. There’s no magic to the manufacturing process. But this gives me renewed inspiration to bend sheet aluminum to my will.